Earlier this week, the White House's Council of Economic Advisors published a report that is required reading for anyone seeking to understand the long-term impact of SNAP (aka food stamps) on our nation. The report, which references over one hundred pieces of peer-reviewed research and government analysis, points to a single conclusion: #SNAPworks. Most people understand that SNAP exists to feed the hungry, and the report confirms this — participation in SNAP reduces food insecurity by 20-30%. What's more, the report found that a temporary increase to SNAP benefits during the recession lifted 530,000 families out of food insecurity. SNAP improves health. The program has a positive impact on recipients’ self-reported health status, decreases health risk factors among children, lowers the likelihood of obesity in later life and contributes to women's overall health. 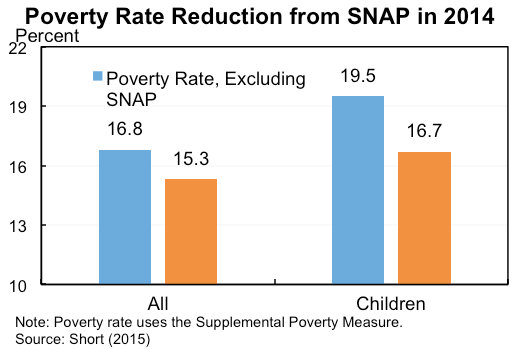 SNAP reduces poverty. SNAP benefits lifted at least 4.7 million people out of poverty in 2014 — including 2.1 million children. Need we say more? SNAP supports the most vulnerable. Three-quarters of recipient households have a child, an elderly member, or a member with a disability. SNAP lifts us up when the economy puts us down. Poor economic conditions were found to be the largest factor in SNAP’s growth from 2007 to 2011. There have been many recent conversations about how we can improve SNAP and whether the program needs to change. We expect — and welcome — more conversation in the coming months. But this report should make it very clear that we are building on SNAP's overwhelming success, not its failure. #SNAPworks, and so we should work to make it even stronger.